If you travel for the food, one of the most exciting things to do is to take a cooking course in the place you are travelling: choosing where to do it is complicated, because food tourism has created some awful tourist traps in which the quality of the recipes is altered to suit the tastes of occasional visitors more than that of the local foodies. I spent the last part of my holiday on Phuket, more precisely at Patong Beach (which I’ll talk about in my next post): Phuket Town is one hour’s drive from Patong, and there you find the Blue Elephant Cooking School. 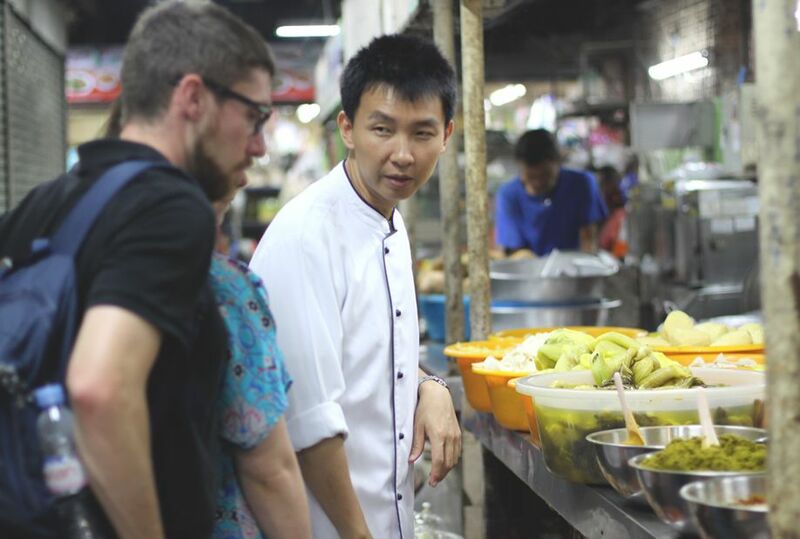 Blue Elephant is a culinary organisation with establishments throughout the world that guarantees the teaching of true Thai cooking; its courses are internationally renowned and one of the reasons I chose it is that the morning course includes a trip to the Phuket Town market. Which is precisely where I’m taking you now. The market has three areas: one outdoor, with fruit and vegetables; another on the upper floor, where there are meats and fish; and the third on the lower floor, with spices, dried fish and more vegetables. So we have three different spaces and types of lighting, varying from natural light to confined spaces: well, let’s make sure we’re ready to alter exposure, shutter speed and perspective. My course companions and I were accompanied by Tom, a chef from Bangkok and teacher at the Blue Elephant (important point: he spoke perfectly comprehensible English, whereas often in Thailand I’ve found it difficult to understand people, due to the hybrid Thai/English). Here he is, at the curry stall, explaining the different spices. It wasn’t easy to take his photo: first of all, people’s faces aren’t very photogenic whilst they are talking, and also the spaces were really tight. I had a reflex camera with a fixed 50mm lens; Tom made rapid movements and I didn’t want to miss his explanations. I set my camera to aperture priority and manual focus, aimed at the food and shot the picture. At Phuket market, I saw some enormous fish; so big that I had to take a vertical picture to get them all in the frame! 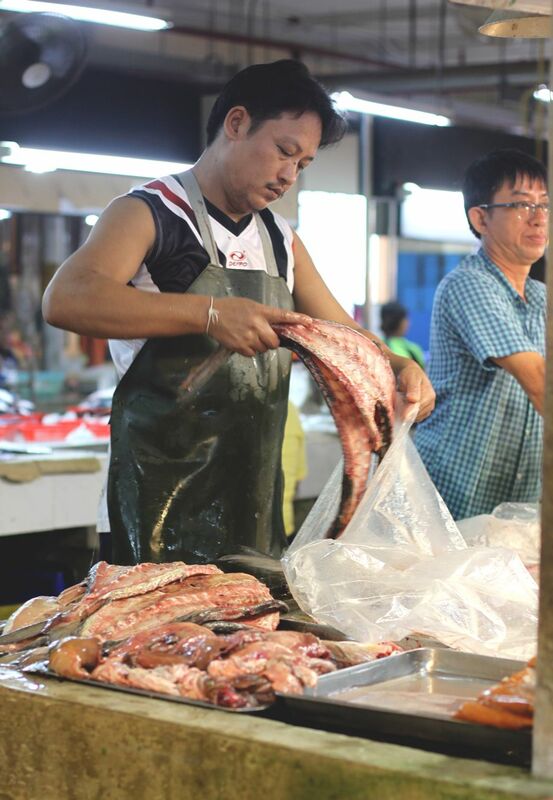 I captured this stall holder with his slick apron, as he pulled out already skinned fillets. At a market, nothing is more meaningful than the people who dirty their hands at work with their wares, and this man was definitely the best example. 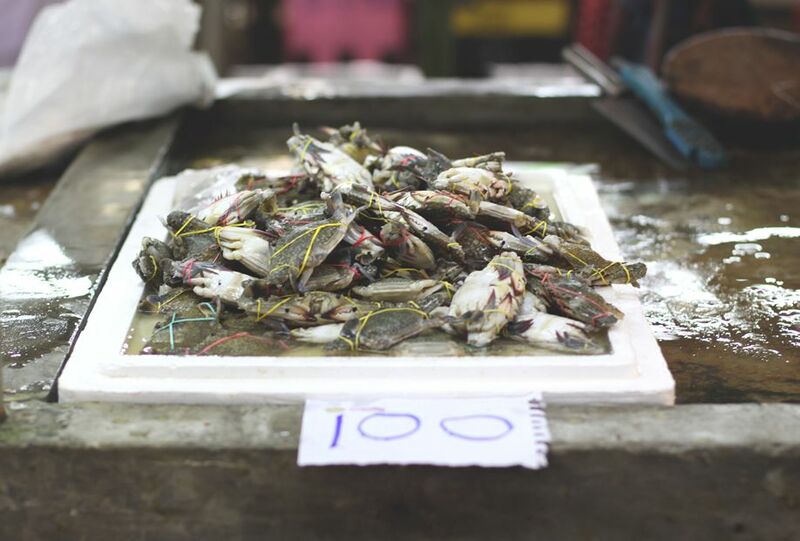 The market is teeming with live shellfish, their pincers held shut by coloured elastic bands; all the fish is displayed in stone baths, always wet and untreated. The fish costs hardly anything (100 baths cost around 2 Euro). For this photo, I widened the aperture to 2.2, focusing on the top of the pile of crabs, and shot leaving in the less pleasant aspects of the scene, such as the cleaver in the background. There is no shortage of meat at the market too; whilst we are used to seeing only the luxury cuts, here a different view is taken. 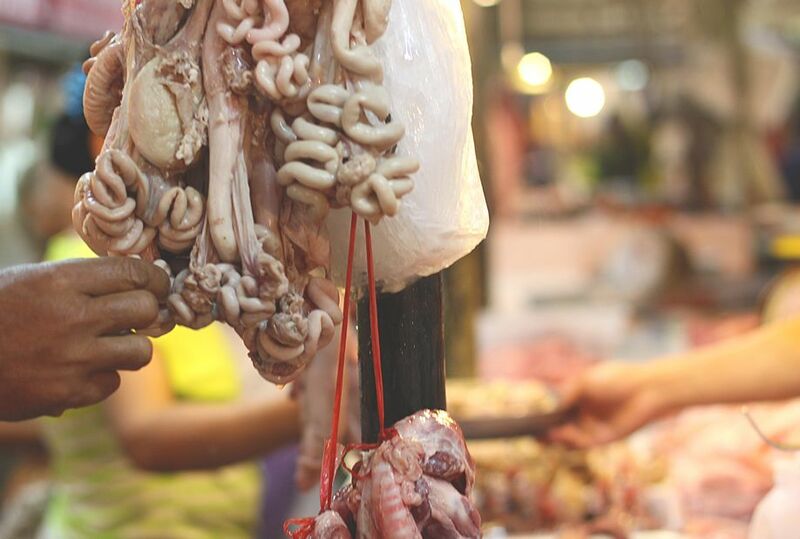 You could say that there is an absence of ‘visual merchandising’, with meat cuts and offal displayed by hanging them on metal hooks. Your purchase isn’t guided by sight, but by smell and consistency. The photograph below was out of focus because I used an overly rapid exposure time; I adjusted it in post production using the sharpen mask filter. A hand in the foreground, a hand in the background: it’s all about hands on the food! 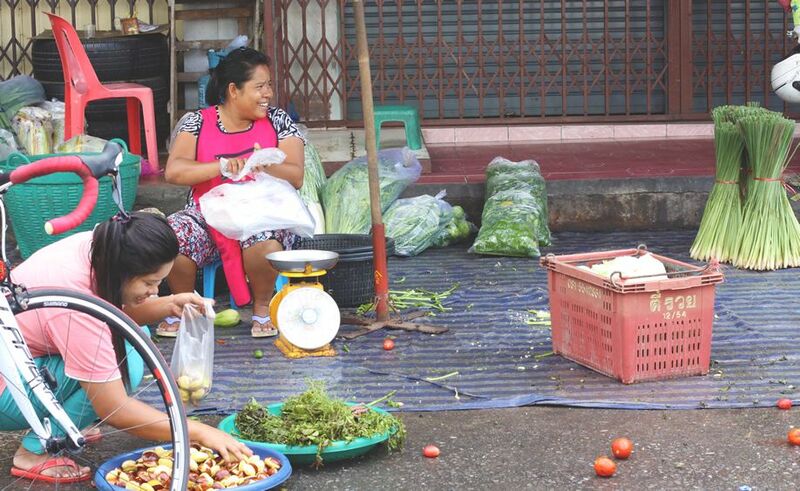 The outside of the market is full of women at work; in most of the markets, the women prepare food that will then be sold or eaten. They prepare fresh pasta, clean vegetables, weigh and sort newly-arrived spices and herbs. To take the photo below, I got down low to be as close as possible to the height of the two women, keeping my focus on the seller at the back. Imagining a six-square grid, the main subject is always placed at an intersection between two lines (the rule of thirds, which I always follow). In Thailand, I ate the best fruit in the world: mango, papaya, pineapple, banana. Flavours that are different, succulent, sweet, mature and soft. The strangest fruit I ate was the Red Dragon Fruit, or red pitahaya: on the outside, it is pink with green excrescences; on the inside, it is white with little black seeds. The flavour reminds you of a pear and is very delicate. The real surprise was the grapefruit, which I don’t usually like; here, as well as being less sour, it was also served with a mixture of salt and chilli pepper: delicious. 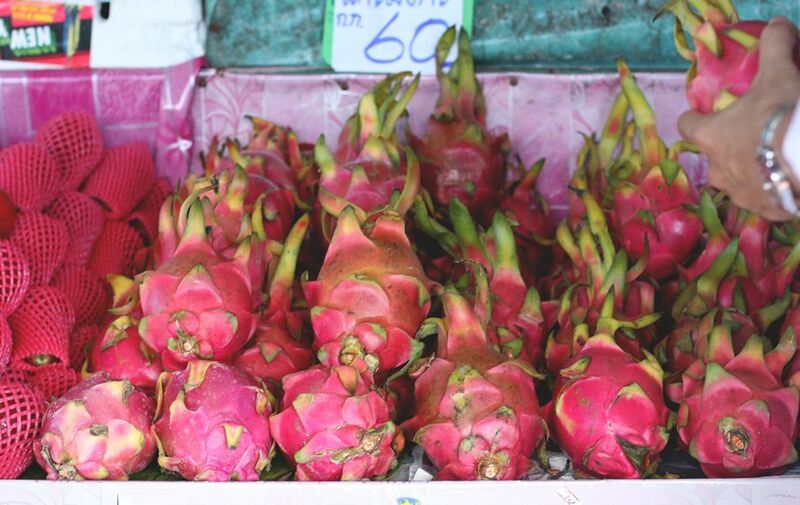 The Dragon Fruit have an advantage: they are so pretty that even piled up as you see below, it makes a good photo. 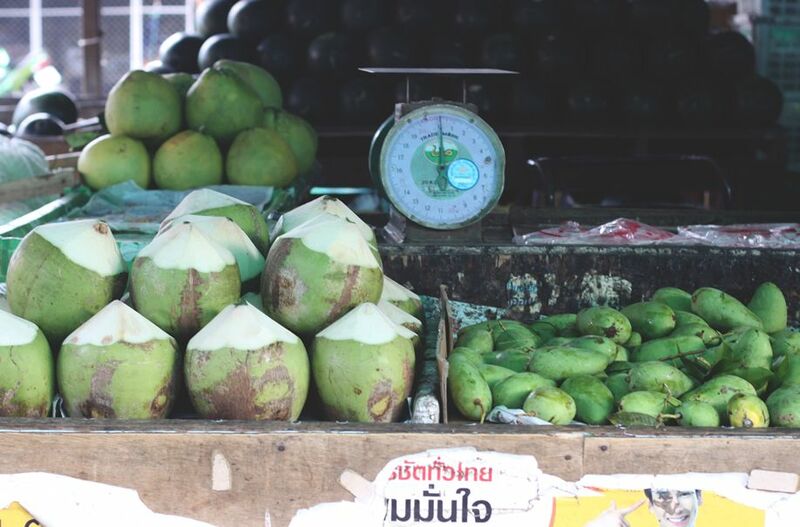 A special mention must be given to the green coconut, of which you drink the milk: this fruit is nothing more than an unripe coconut, at about six months’ mature. The liquid it contains is rich in mineral salts and is very low in calories: on the streets and at the markets, the top is cut off and it is served with a straw. The juice is sweet and revitalising. In order to render the image of a market setting, I left the scales in the centre and brought the fruit into focus. The trip to the market is over, and we continued the morning with cooking lessons from Chef Tom. 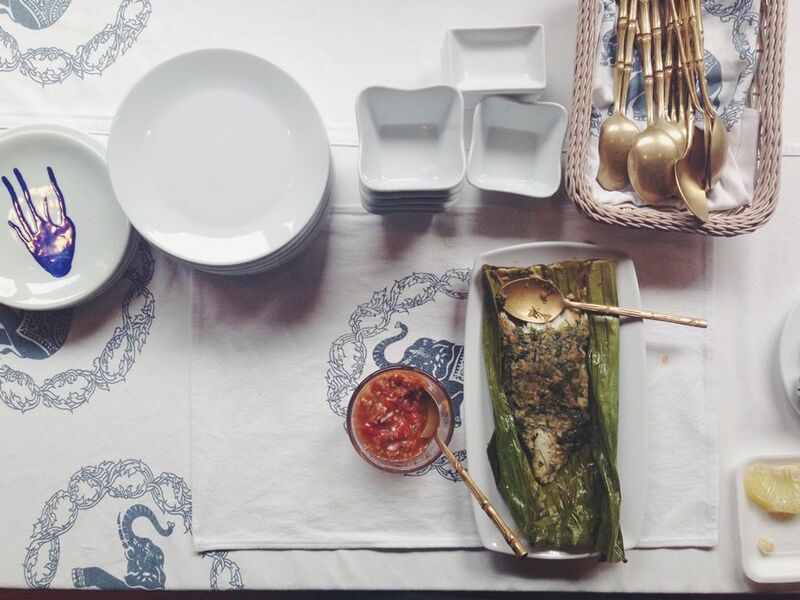 The dish below was one of the results of the course: grilled fish with Thai herbs (original name: Pla Paow Samoonprai), cooked in banana leaves. I took the photo with a smartphone, because it was the easiest way to take a picture from above without standing on a chair (which seemed a bit inappropriate). When photographing table settings, one of the ways to make the food stand out is to include various elements arranged in such a way as to leave a space around the main dish, which is just what I did. The course ended with a lunch where we ate all the things we cooked: satisfaction guaranteed! Mariachiara Montera works as a Digital PR, organises events and is a food writer and blogger. Born in Salerno, she has lived in Bologna, Milan and now resides in Turin, home to the best ice cream in the whole of Italy. After working for years in publishing and communications, she went freelance in 2013, choosing to devote herself 100% to that which she really loves: food, and the people surrounding it.